It all went well, but then, after a kilometer, without warning we suddenly broke into a fech fech deposit and that forced us to accelerate hard in order to prevent us from sinking in the soft ground. Although howling like a tormented beast, the Land Cruiser’s diesel engine, due to its low speed and high engine torque, coped with the challenge. With our wheels down to the hubs in the powdery silt every meter took engine power but before our speed was reduced to nil we reached a firm patch of soil on which we gathered momentum for the next hundred meters. The clutch had suffered some extra wear, but half an hour later and in good spirits we arrived at the opposite side of the valley. The shallow hills were already casting long shadows when we all met at the coordinates of our first discovery. There were no further meteorites to report. Although the light was still good for searching we agreed to call it a day and so our convoy headed for a shallow qued in the east of the Aouirtefou that Andi had spotted earlier. The idyllic place matched our definition of a perfect camp site. We pitched the tents on the sandy floor of a gully and put up the large table under the crown of an acacia. Thomas began to prepare a guacamole while a bottle of Guerrouane was opened. Toasts were brought out to honour the finders and to celebrate the day’s success and everybody shared their impressions of the search. The scenery was utterly beautiful. 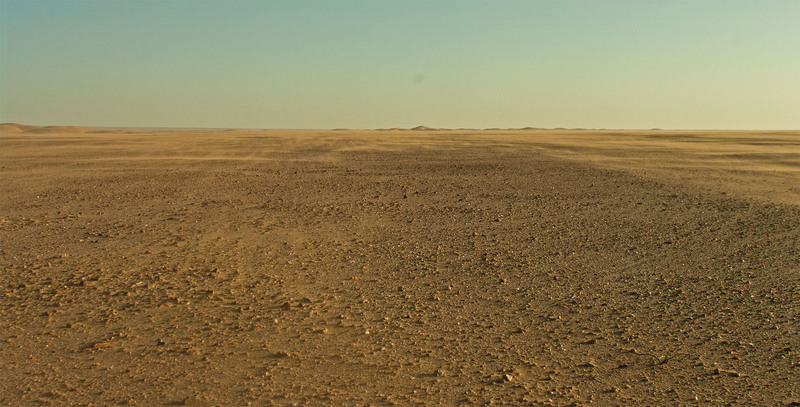 The qued with its softly undulated gravel banks casting long shadows, framed by umbrella shaped acacia, contoured like silhouettes before the night blue horizon transcended an ultimate placidity that only the desert can offer. In these golden hours of the ending Sahara day, when the wind had died and the silence was absolute, the spirit of peace and tranquillity became almost palpable. As if to compensate for the meagre campfire of the previous night, a pile of wood was lit that could have easily kept us supplied for a week. Although our camp was located in a depression it was obvious that we could now be seen for miles. Since we were in a friendly country there was no reason to conceal our position and so nothing spoke against the bonfire that provided warmth and light. I went to bed early. Thinking of the 14-hour workday that lay before us, I did not feel like missing out. From the increasing volume of laughter and singing, however, it appeared that a serious party was going on. As long as everybody reported for duty in the morning there was no reason to not have some fun. Soon I drifted into sleep. Suddenly I woke up. At first I didn’t know where I was or how long I had slept. What had woken me up? There were excited voices outside. I could make out Marc, Sergey and Andi who were talking all at once and in the confusion it was impossible to figure out what had happened. For a while I listened hoping to pick up some useful information but caught nothing that made sense. When nobody came to wake me up I decided that whatever it was that caused such a stir, it was not sufficiently important to drive me out of my warm sleeping bag and into the cold outside. Drifting back into sleep, I half overheard Andi assuring Marc and Sergey that he had seen two figures sitting not far from our camp. Apparently he had left the others for a stroll to enjoy the night sky and had run into the two locals sitting nearby. Andi repeated his story over and over but obviously there was nothing more to it than just that. It sounded pretty much like a storm in a teacup. Apparently all the fuss was about an accidental encounter with two fellows camping nearby. This quite relieved me, and I tried to go back to sleep despite the agitated conversation that continued. Sleep, however, wouldn’t come, and when from the discussion outside it became clear that my people were about to launch a search expedition to find the two fellows, I felt that some deescalating measures might be appropriate. I cursed, and fully awake now, decided to get up and see what could be done to calm everybody down. This, however, was to no avail because by the time I had peeled off my sleeping bag and put on my boots and jacket, the others had already disappeared into the darkness. Perhaps due to the late hour the search effort somehow lacked coordination and so everybody had departed the camp in a different direction or got lost along the way. I couldn’t suppress a chuckle when I heard Andi and Marc shout and whistle for each other in the dark, the occasional beam of a flashlight dancing in the distance. As could be expected, they didn’t find each other, let alone the two mysterious strangers whom they had set out to confront. Andi was easy to make out in the dark because he was wearing his obligatory headlamp. We had talked about the subject of night vision earlier. While I shared the opinion that night vision under the cloudless desert sky and particularly on the bright sand floor, even in a moonless night, is always best with the naked eye, Andi had reasoned for the use of a powerful LED torch. I had pointed to the fact that the use of bright artificial light ruined ones natural night vision and rendered everything outside the light beam pitch black. Obviously I had not been very convincing. I sighed and sat down at the fireplace and looked at Thomas, who must have left the party earlier as well, and who now opened his tent to peer out with sleepy eyes. ‘What the heck is going on here?” he asked. I nodded over to the dancing light in the distance. ‘Lads got lost in the dark while trying to find a pair of locals.” ‘You serious?” The look Thomas gave me made it clear that he wasn’t buying a word of my explanation. Nevertheless he put on his jacket, grabbed a chair and joined me. Meanwhile the fire had burnt down to embers on which I now flung a couple of logs. Two minutes later the light of the flickering camp fire could be seen again from the higher ground at the other side of the qued. Soon Marc appeared from the dark, and then also Andi returned to the camp. ‘We tried to find the two people I saw. Then I couldn’t locate our camp in the dark. It’s impossible to keep directions here at night because it all looks the same” Andi choked. ‘It’s actually pretty easy’, I couldn’t resist saying. ‘How?’ I pointed over my shoulder to the North Star, unmistakeably emblazoned in the sky above us. ‘Kinda hard to make that out with my headlight on’, he replied to his defence. ‘That is exactly what I’ve been trying to tell you mate’, I said, referring to our discussion about proper night vision earlier. Then Andi repeated his story of how he had encountered the two strangers ‘spying’ on us. ‘Did you introduce us and offered them a place at our camp fire?’, I inquired. ‘Hell no’, came his puzzled reply, ‘I was totally shocked when they appeared in the dark, sitting there just five yards in front of me.’ I grinned: ‘So you flashed them with your headlamp, then turned away and went calling for backup?’ ‘They were so well hidden that I almost stepped on them. Not even a fire, just some glowing embers in a pot’, he explained. ‘Well that is how the Berbers keep the fire to brew their tea’. The method is as ingeniously as it is labour-saving. Nothing secretive about it’, I said. ‘But they were so close to our place’, Andi gesticulated. ‘I hadn’t seen it that way …’, Andi thoughtfully replied. Seeing that he was not yet totally convinced I continued to explain that among the desert dwelling tribes of the Sahara it is considered impolite, and may even be understood as an act of rudeness and disrespect, to walk up to another camp after dusk. For this reason a new camp is usually pitched at a certain distance, often within sight, in order to show that one has nothing to hide, and that’s most likely how it was in our case. It appeared that I was partly to blame for my friend’s fearful reaction to the sudden encounter. On the previous day, during our drive into the desert, I had briefed Andi about the known activities of terrorist groups that operated across the Moroccan borders in neighbouring countries. I also mentioned an infiltrating attempt of one of these cells that was fortunately forestalled by Moroccan armed forces, and in the process I advised my co driver to always keep his eyes open and to be alert in the desert. In this case he had followed my advice, and consequently taken the first two shepherds who came along for a local sleeper cell. This in mind, it was understandable that Andi was still too keyed up to accept that two locals posed no threat to us and that in fact it was our behaviour that was inappropriate. ‘I will sit here and keep watch’, he insisted. ‘I join you’, Marc happily agreed, true to the motto that a trouble shared is a trouble halved. Also, for the jaunty Swiss there was no reason to go to bed as long as there still was some action going on in the camp. ‘I’m fine with that’, I said, ‘as long as you guys keep the sound level low and show some good manners in case we have another visitor.’ The two of them were joined by Thomas who said he couldn’t sleep after all the fuss. Relieved that things had finally calmed down, I retreated to the comfort of my sleeping bag to finally find the sleep of the just. This time sleep came quickly – but lasted only about fifteen minutes. An earthquake, I thought, while a thunderous roaring echoed through the nightly qued. Within a split second I was out of my tent, only to find that the intriguing noise originated from the three watchmen who had simultaneously fallen asleep in their chairs at the fire place and who now were engaged in a ground-shaking snoring battle. I made a mental note to better make use of the extensive space available instead of ever putting my tent so close to the fireplace again. During our breakfast we discussed the night’s events and in order to prevent similar situations we agreed upon rules of conduct for future encounters with locals. Whoever would spot a local would actively seek contact and introduce ourselves. Presents, like juice, eggs, canned tuna and similar, would be given and we would explain who we were, what we were doing and respectfully make sure that our presence in the area was approved. This deemed appropriate to everybody and folks were eager for an opportunity to practise this new approach. When we broke camp, as usually, we made sure that the spot was restored to its state prior to our arrival. This time the only exception was a small box with a note pinned to it, that Marc had prepared and which we left under the acacia. It contained some salt, tea, sugar, a bottle of water and a 100 Dirham note that was intended as a belated present for our hosts, just in case our nightly visitors returned to the place. Most probably the box still bleaches in the sand. The morning was uneventful. Gridding the western side of the valley until noon yielded no further finds. Since we had found four different masses on an area of merely two square kilometers there were reasons to believe that other meteorite aggregation zones existed that might hold a similar number of finds. Thus, after lunch, we changed course and traversed the Anmat al Kebch southwards. Our target was a circular structure east of Graret Oum Sedra that, in the satellite chart, appeared to be an elevated ring of bright outcropping rock with a diameter of approximately 600 yards. Several smaller circular structures to the south of the main ring lead us to the hope that these features might be impact related. Admittedly the probability for this was near zero, but since we were already in the area we might as well check the place out. Apart from a flock of camels roaming the barren landscape we did not see a living thing on our journey. The ring structure revealed as a group of small outlier mountains, composed of weathering-resistant dolomite that towered a silty plain with occasional chert gravel and shallow brushes. There were no deformations, fractures or faulting in the outcropping bedrock, no shatter cones and not the slightest hint of brecciation anywhere near the feature. ‘Not an impact crater’, Rainer declared. Instead it appeared that the chain of outlier mountains was the remains of yet another karstic depression, that had been breached by the Tertiary river bed to the east and that was now filled with old alluvial deposits. While the other two cars scouted the terrain farther south, together with Andi I climbed one of the small table mountains to enjoy the view. If it was not for a cluster of brittle camel bones bleaching in the sun, one could have taken the blinding white panorama to be the surface of distant ice planet. An hour later the others returned from their scouting tour. The terrain farther south was dipping towards the valley to the east of us and covered by the same fine grained silt and alluvial gravel that filled the neighbouring depressions. The low elevation and characteristic geomorphology pointed to the fact that it rather represented an accumulation surface than a deflation zone. This did not rule out meteorite finds on principle, but statistically these geologically rather recent surfaces hardly provided the conditions under which millennia old meteorite falls would be preserved on the surface. With the sun now standing in the west the ideal course would actually have been eastwards by this time of the day. In the east, however, the towering dunes of the Draá Afrafir lurked at the horizon and after consulting the topographic charts and to avoid any unnecessary risks, we intended to cross this obstacle with minimum effort. Some 20 miles south of our position the satellite chart showed an area in the dune belt where the gaps between the single 90-foot dunes grew larger and this was our target. Traversing across the valley towards the south we soon reached the area and indeed there were broad interdune corridors between the isolated sand ridges. 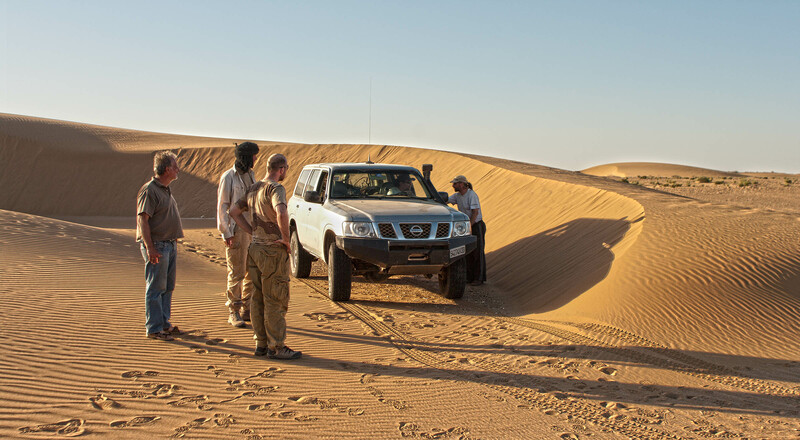 After a promising entry corridor was found we crossed the six kilometer deep belt within half an hour, a fraction of what it would have taken us, had we tried a more frontal approach farther up north, where the individual dunes connected into a single sand field. To my surprise the Draá Afrafir was not formed by giant star-shaped draas, as the name would suggest, but by the much smaller arc-shaped barchan type dunes. Compared to the large draas that can reach heights of up to 900 feet and which formed in the Pleistocene under much higher wind velocities than are possible today, the barchans belts were of more recent origin, some of them as young as 5,000 years. 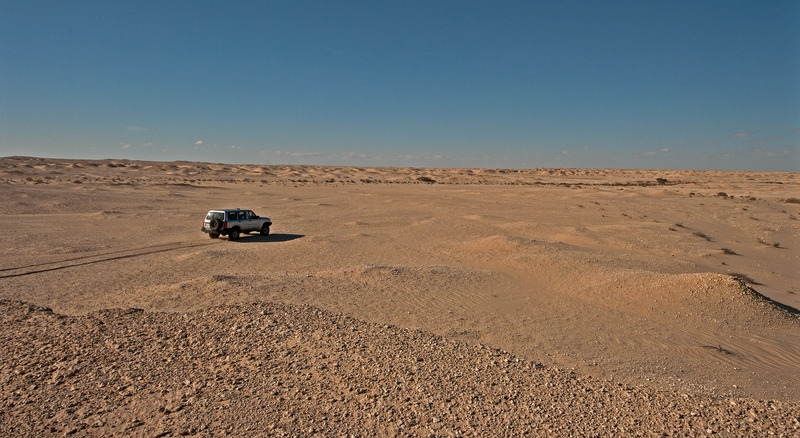 Barchan dunes require an environment with a relatively low sand availability and unidirectional wind to form. Unlike the impenetrable draa fields, barchan dunes often have corridors between them, which are oriented along the prevailing wind direction. In this part of the Sahara barchan systems were always north to south oriented, thus, resembling the direction of the trade winds. 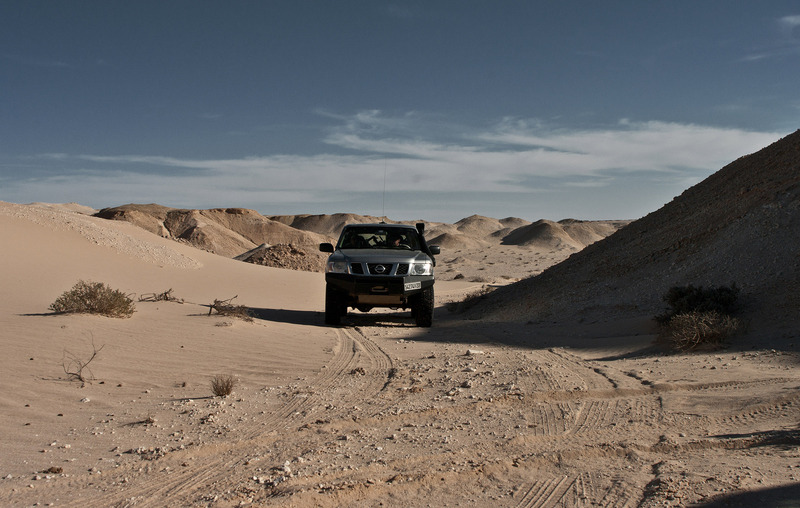 When we emerged on the far side of the dune belt a waypoint was chosen for the evening’s rendezvous. Then the command ‘everyone for himself’ was issued, and our convoy fanned out into search mode again. Between the dunes Rainer had found a fine grained reddish-brown rock that reacted to the magnet. After measuring its magnetic susceptibility with the SM-30 he considered it as a ‘low-chance candidate’ for an exotic achondrite type meteorite. Rainer’s diligent practice to document and pack every sample that could not be determined with certainty in the field had already led to a number of meteorite discoveries in the past. As a matter of course, many of these undeterminable samples later turned out as terrestrial rocks during analysis in the lab, but that was acceptable. Half an hour later and to his dismay we crossed a plateau that was littered with huge chunks of this rock variant, which, in honour of its discoverer, was instantly dubbed ‘Rainerite’ by the team. The hours passed by and the terrain changed into a pattern of undulating gravel tableaus intersected by shallow queds. Frequent encounters with vast fields of Rainerite provided plenty of opportunity for silliness on Rainer’s expense. Our easy going chief mineralogist took it with humour. Finally, after climbing another hilltop, in the mist at the eastern horizon a mountain came into sight. According to our map it was the Rbiyeg Togoyas, which was the southernmost tip of the Djebel Amssirdad, a mountain chain that ran almost parallel to the coast and expanded as far north as Lemsied where it is cut by the gorge of the Saquia al Hamra. Here, at its southern tip, the chain was composed of Palaeocene to Eocene dolomitic sediments and capped by a layer of neritic or continental sandstone. The latter gave the needle like summits an appealing red colour that provided an intense contrast to the bright dolomite rock. Between us and the Djebel was the Qued Win Gamous, a two-mile broad dry valley with single nebkas, which were stationary shrub-coppice dunes supported by deep rooting sand and salt resisting trees. These were of the tamarisk family and the lush green of their delicate branches gave the valley a garden like appearance. A nice place for a camp, but from experience we knew that the vegetation attracted the usual critters and crawlers, which in turn attracted the truly harmful creatures, predators like the horned viper, which we preferred to avoid. On crossing the qued we stopped at a group of acacia where we collected the dry branches and half an hour later we had climbed the middle terrace on the opposite side and reached the foot of the djebel. Despite better knowledge I charged the mountain from its leeward flank. Gathering momentum in the plain and ascending the first hundred meters uphill seemed easy. However, closer to the top the gradient became almost vertical and the sand drifts grew higher. Another fifty meters and one downshifting later my ambitious attempt to climb the high terrace had failed miserably and we were bogged down to the axles. Not even the doors could be opened. Andi shot me one of his you should have known better-looks and insisted that I’d dig out the car on my own. A ‘disciplinary measure’, as he put it. It turned out the challenge was not to free us and to get us downhill again, but to do so without capsizing the overloaded vehicle on the steep slope. By working with the 4WD Low gear I inched us backwards in the deep sand and after reversing in an awkwardly oblique angle I finally managed to point our front downwards again. My little overconfidence had cost us half an hour and some cold sweat but there was still plenty of light to work. We caught up with the others and in the hope that ascending the mountain would be easier from the opposite side we fixed a waypoint for tonight’s meeting on the high terrace between the two summits. Then we fanned out again to continue our search on the plain. After two long days of scanning the surface for meteorites one had developed a sensitivity for dark objects that was way beyond the eye’s average capacity to process detail. Several times minute black spots, passing by twenty or more yards from the car, attracted my attention and on inspection revealed themselves as the chitinous carapace of a Tenebrionidae. In terms of meteorite prospecting this could be considered as a passed eye test, because anyone who was able to spot the delicate chitin shell of a darkling beetle on the desert pavement would also catch the sight any other alien object. On one occasion both, Andi and I spotted a dark anomaly over a distance of almost 600 yards. Although the sight instantly reminded me of the discovery of the large landmark meteorite in 2008 it quickly became apparent that the disturbingly large body was not a meteorite. Half way to the object in question we passed a burial site consisting of two Islamic graves. 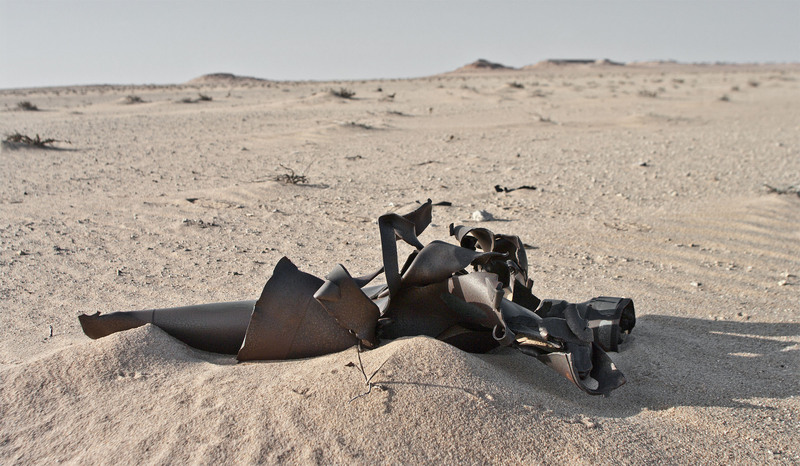 As indicated by the military gear, which was strewn about, these were war graves from the Western Sahara conflict. On passing by we paid respect to the fallen combatants. It was always a bitter sight to see young lives perished before their time, regardless on which side they fought. We did not get out. As always when crossing an obvious battlefield I felt uneasy and I advised Andi to carefully watch out for ordnance. It was of little surprise that the object we had seen from the distance fell in the latter category. It was a mushroomed 122 mm HE projectile, fired from a BM-21 Grad-type launcher. With its sand brushed patina, its casing torn into lamella of twisted steel the detonated rocket reminded me on those modern sculptures that instead of transcending mere pleasantness rather fascinate through an aesthetic of terror. We left the site behind us and penetrated deeper into the plain on the opposite side of the mountain. This was the beginning of the Reg al Mhoum, a vast gravel plain of 4,200 square miles that stretched beyond the Wadi Awletiss straight to the massif of Gueltat Zemmour in the east. In a peculiar sense I felt attracted by the seemingly endless expanse. It was as if a gravitational force pulled me deeper and deeper into the barren void and although I knew that we had to return due to the late hour, I couldn’t fight the urge to continue. ‘Only two more miles’, I told Andi, who impatiently tapped at the GPS display on the dashboard. The sun was setting quickly now and it was a bad idea to return too late and ascend the mountain in the dark. After the two miles had passed I gave in and turned the car around. On our way back to our meeting point we met Rainer and Thomas who had already scouted a navigable passage to the high terrace and picked a spot for the camp. All we had to do was to follow their tracks. Exhausted from a long day of driving we dropped in the sand to catch the last rays of the sinking red sun. Later, with Thomas and Andi I went for a walk to the summit where we found the earth of a fennec. While I peered into one of the cave’s entrances I heard a surprised shout from the other side and looked up just in time to catch a glimpse of the agile little desert fox that had suddenly darted from between the rocks and now made a dash towards the neighbouring outcrop. The desert fox with its disproportionately large ears was a familiar sight to me, but every time I stumbled upon it I was surprised how tiny the creature actually was. Since the fennec is a nocturnal predator we had probably woken it up from its well earned sleep. Andi, a passionate huntsman, inspected the bones and carcasses that littered the entrance of the cave and with an admiring whistle he picked up the huge skull of an adult scavenging bird. It was the skull of a Lappet-faced or Nubian vulture, a giant species, ranking as the largest winged vulture with a wingspan of 2.5-2.9 yards. Adult males were reported to weigh as much as 13 kilos, and we wondered whether the minute fox had actually killed the giant bird and pulled it into its earth, despite the fact that the vulture was ten times heavier and bigger than the fennec itself. Judging by the heap of bones the other diet of the fox included rabbits, small birds, lizards, mice and at least one large snake. ‘You can’t be picky in an environment like that’, Andi commented.